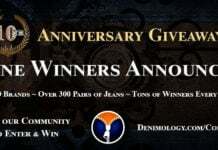 This week’s giveaway is sponsored by Luello.com who are giving one winner the opportunity to select two pairs of jeans from the selection by Rock Revival that they are currently stocking in their online store. Casual luxury meets lifestyle fashion: this is the philosophy of Luello and Rock Revival alike. One is a premium online shopping-destination, the other an innovative denim line that transcends genres and style boundaries. Drawing inspiration from the music world, and particularly from the many different styles and subgenres of rock, Rock Revival brings a wide-range of intricate designs and style to quality denim fabrics. Luello aims to carry brands that meld different styles and cultures, combining designs at the forefront of fashion trends with classic styles that transcend the passage of time, particularly with their assortment of denim brands.